I wrote a post here 2 months ago. I didn't think it was that long. Since I finally sat down and decided to write here, I came up with a challenge to put myself in some of the categories in "there's only 2 types of people" sayings. 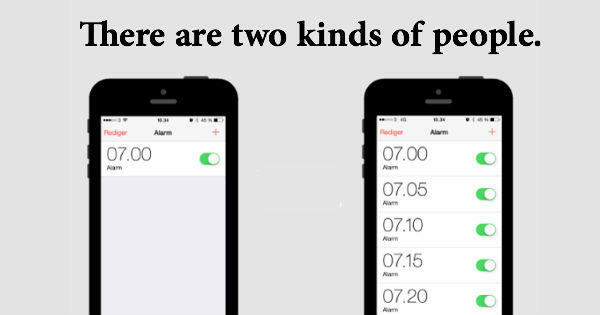 The rule is that I have to put myself in one category even if I'm in the middle. So I really have to think about myself and decide which one I am more. I did something similar in my post Typical girl vs. me so check that out too. Let's go. I can't understand girls/women who can't wait to take off their bra. I sometimes fall asleep with it and don't mind at all. I also feel really weird whenever I'm not wearing it (like only when I'm in my PJs). I love my nails and nail art and all that goes with nails. I love trying out different shapes, painting them and just playing with nail polishes. Even plain painted nails look 100% prettier to me. Not that I don't wear colors, but pink really isn't my color. 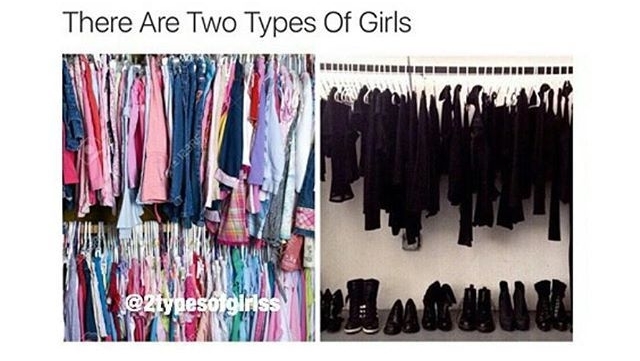 But for clothes in general, I prefer black and dark colors. I like to have everything in its place and so I would know where something is. My room is quite small so I can't afford to be messy. And it's seriously not pretty to see a messy room. I wear ponytails only when I'm working out (so never) or when my hair is kinda greasy. I also sometimes put it in a bun or ponytail when I'm at a concert. I get up at the first buzz of my phone and I never fell asleep if I know I really have to go somewhere or do something. I immediately get up and my day starts. I'll eat it if the pizza is fresh and the dough is still soft. However, if I'm eating the same pizza next day, I'll most probably leave the crust. Also, my mom really loves the crust so I usually leave it to her. It depends on which platform I'm using, but I send multiple texts in only one and that's if I'm having problems with keyboard or something else. I get pretty annoyed with multiple texts. I'm actually early in 99% of cases. I like to calculate some extra time in case something happens in traffic or something like that, so I'm usually at least 10 minutes early (more like half an hour). I don't know if I ever used numbers on top of the keyboard for really numbers. I got used to this arrangement and I can't go any other way. I actually never cut my sandwiches or toasts, but if I did it, I would do it diagonally cause a toaster that we had 1000 years ago had it like that so I thought that was the only proper way. I never used iOS (so an iPhone) and I immediately went from those old phones to Android smart phone so I'm so used to it by now I can't imagine using anything else. I read all my messages and emails so there's always some order. I don't mean empty as I have to delete everything, but there are no unread or unanswered messages. 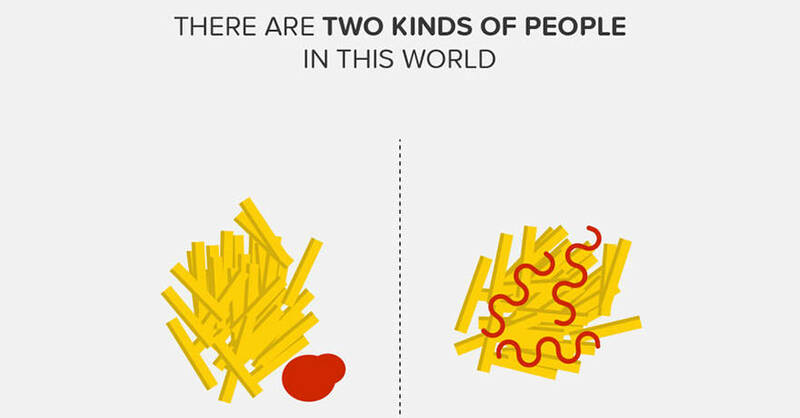 I really don't care and it depends actually what I'm eating, but I'm more likely to put it on my fries. Dipping fries with a fork in ketchup always ends up with a fry stuck in ketchup and empty fork. When it comes to my computer, I'm really organized person. I love putting everything in designated folder and it makes my life so much easier. I can't stand desktop full of random icons. lunch at 1 p.m. vs. breakfast at 1 p.m. - lunch at 1 p.m. I go to sleep really late and I get up really early. I usually sleep only 4 to 6 hours, but I'm fine so far. I also hate to waste the day with sleeping in late so I'll definitely eat lunch by 1 p.m. Since I've been raised with toilet paper always being outwards, it's normal that's the only way I can see it now. The other direction looks really weird to me and I can't use it like that. Whenever I eat chocolate, I almost never eat alone so I can't just bite it. Also, I never even thought of it. There are marked lines and rows and I'm going to use them. I can't remember if I ever ate in the bed something else than chocolate or candy. Even then I keep this food on the side table or floor and I'm never lying down, but sitting. No, I don't eat in bed. For some unknown reason, I feel very much in love with Batman. I love those movies (yes, even those that are considered crappy). 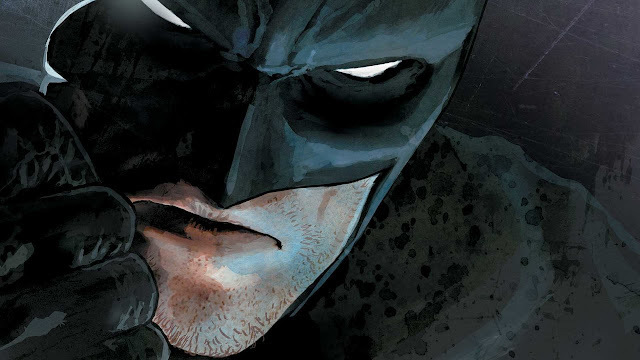 Don't know why, but I'm totally a Batman girl. I could have done more, but 20 seemed like a good number for this post not to be too long. Also, if you want to see any other category, just comment below and I'll either answer it or make a part 2 of this. Since this is a challenge, I'll tag some people, but anyone is welcome to join in. If you write this list, send me a link so I can read it. 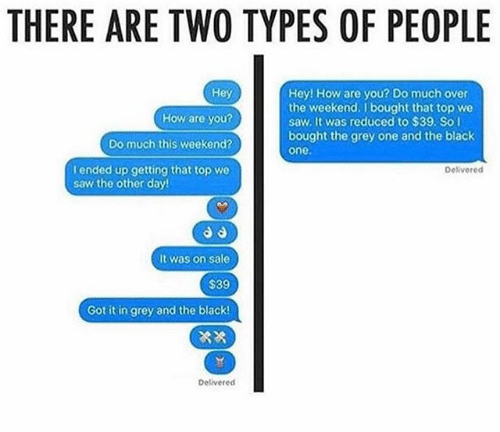 I just Googled "two types of..." and chose some. You can do these or make up any other that you want.